Hertford County is a small, rural county located on the Virginia border in northeast North Carolina; the county seat is Winton. It is majority black, with 60.5% of its residents identifying themselves as African American. Winton is also the site of the Meherrin tribe, which is seeking federal recognition. Given the large black population, Republicans have no hope of carrying the county in any election. The last time Hertford voted for a Republican for President was back in 1972, in Richard Nixon’s 49-state landslide against George McGovern. This was when many blacks were not registered to vote. In 2012, Hertford gave Obama nearly 72% of the vote, even higher than his total in 2008. This can be attributed to increased turnout from black voters. Next to Durham in the Research Triangle, it was Obama’s best county in the state. 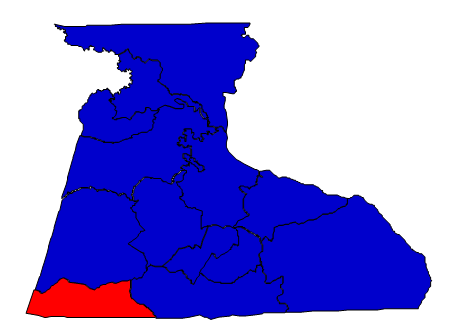 Forecast: Hertford County can be expected to go for any Democratic candidate. This is due to its high black population and not a reflection of any kind of social or cultural liberalism – 70% of Hertford County voters voted for the gay marriage ban in May 2012. Black turnout is expected to decrease in 2016, which may help Republicans exceed 30% of the vote. Unfortunately for Republicans, blacks are increasing their numbers in the county much more than whites, so the Democratic trend is expected to continue. The growth rate during the 2000s was a steady 9.15%. The bottom line – Hertford County has been majority black, and solidly Democrat, for a long time, and that’s not going to change anytime soon.